SINGAPORE (Nov 14): According to the Credit Suisse Research Institute’s 2017 Global Wealth Report, Singapore’s household wealth increased by 3.4% to US$1.2 trillion ($1.6 trillion) and is expected to increase by 2.3% per annum over the next five years to reach US$1.3 trillion in 2022. 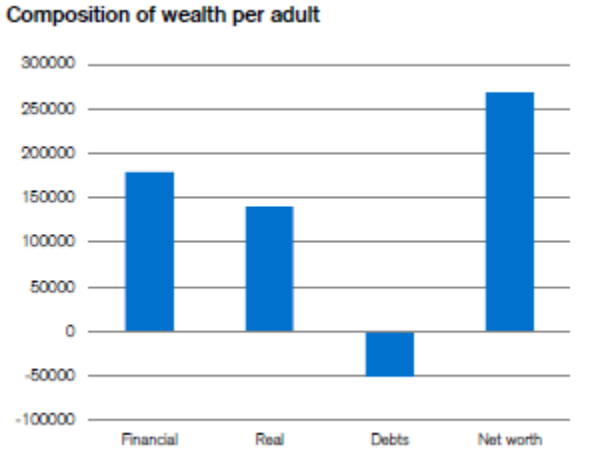 Personal wealth per adult grew strongly in Singapore up to 2012. Since then, it has risen slowly in domestic currency units, and declined a little in terms of US dollars. Despite this drop, average wealth remains at a high level of US$268,800 per adult in mid-2017 -- ranking ninth globally among major economies -- compared to US$115,560 in 2000. The rise was mostly caused by high savings, asset price increases, and a favourable rising exchange rate from 2005 to 2012. Similar to Switzerland, financial assets account for 56% of gross household wealth in Singapore. Meanwhile, the average debt of US$50,570 per adult is considered moderate for a high-wealth country, representing 16% of total assets. In 2017, the number of millionaires in Singapore increased by 2.7% to 152,000. These individuals own a total wealth of US$570 billion, an increase of 8%. Meanwhile, the number of ultra-high-net-worth individuals (UHNWI) in Singapore also increased 15.3% to 961, ranking 20th globally. Credit Suisse expects the number of millionaires to grow 2.3% every year to 170,000 in 2022 and the number of UNHWI to grow at a similar rate to just over 100. According to the report, total global wealth increased at a rate of 6.4%, the fastest pace since 2012, to reach US$280 trillion. This reflected widespread gains in equity markets matched by similar rises in non-financial assets, which moved above the pre-crisis year 2007’s level for the first time this year. 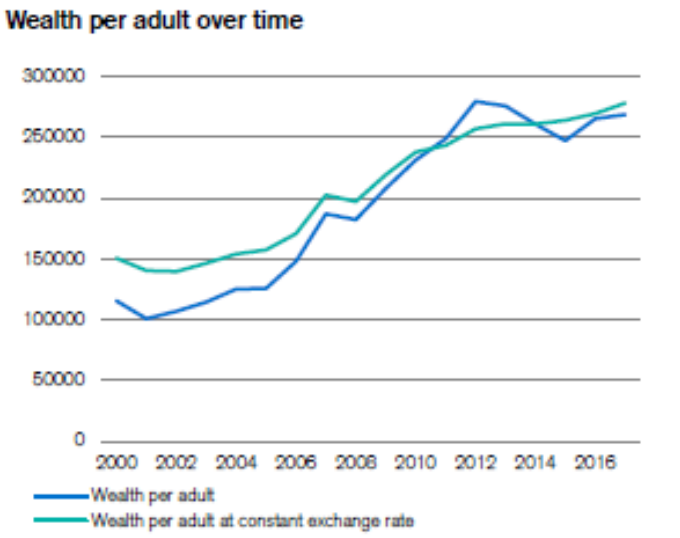 Wealth growth also outpaced population growth, so that global mean wealth per adult grew by 4.9% and reached a new record high of US$56,540 per adult. US leads the gains in global wealth driven by stronger financial assets, reaching about US$93.6 trillion in 2017, or equivalent to 33% of total global wealth. In Asia Pacific, wealth increased by 3% to US$89 trillion in 2016. The slower growth was mainly due to adverse currency movements. China generated the largest wealth growth in the region, with its total wealth increasing by 6.3% to US$29 trillion, due to currency depreciation against USD. According to the report, global wealth should continue to grow at a similar pace to the last half a decade (3.9% expected and 3.8% recorded over last five years), albeit at a slower rate than the previous estimate of 5.4%. Based on this updated forecast, global wealth is anticipated to reach US$341 trillion by 2022. In Asia Pacific, wealth is expected to grow by 5.3% per annum to reach US$115 trillion in 2022, with the fastest growth coming from India, Indonesia and Philippines.